No, I meant song. Katy perry or the other chick. lmao. Yea, I mean Friday the 13th. Okay, lol, yeah my favorite Friday is Part 6; kind of hard for me to pick between 3, 4, & 6 sometimes. But I like Freddy vs Jason more then any of them and makes my list of personal favorite movies of all time. I like 6 the most as well. I also like 4. FvJ is really good too. I remember when it was initially released how divisive it was. It's a shame they couldn't use Nancy's original house for FvJ. 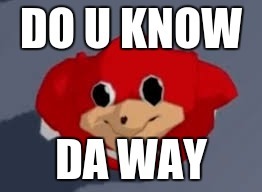 Do u know de wae. She know de wae, brudah. She is de queen. What's your predictions for Volume 5? Hopefully things turn out better in the future. I'm addicted to RWBY now. The songs and story are soo good. The way the world is running right now I'd much rather BE fighting Grimm and living in the world of Remnant myself. Hooray, another fellow Ohio resident! All aboard! Astro Train, punch your tickets people, safety not guaranteed, train may or may not be evil and sentient. All aboard! Also, I got a code for 15% off an order that I won't be using that expires on 8/31/16. PM me if you're interested. That is awesome! I really like Nami as Black Widow. But where is this Fairy Tail Avengers at? I really want to see this. Wait isn't Captain Marvel actually Ms Marvel? "I went into a store and found all the figures I wanted" Said no transfan ever.